I wasn’t allowed in the kitchen while growing up so I wasn’t much of a cook when I left home. My husband will attest to that. Most of what we ate came out of a cardboard box, the freezer aisle of the grocery store, or Pizza Hut. Then there was that year, two kids still in diapers, when I got most of our food from the Schwan’s delivery guy. When my husband couldn’t button his pants and I hadn’t lost any post-pregnancy weight, I decided I needed to learn to cook. Out came the wedding gift crockpot. We ate a lot of beef stew and chicken with potatoes for a long, long time. No one in our young family had food allergies (that we knew of). While my kids grew into young adults, we blissfully ate all types of foods without any worries—-until yours truly developed multiple food allergies and celiac disease and eosinophilic esophagitis (an allergic esophagus). That was the game changer. Suddenly I had to eliminate gluten (wheat, rye, barley, spelt), dairy (no more cheese! ), soy, eggs (are there eggless cookies? ), and more foods. It was hard. Really, really hard. What I struggled with most was finding the staples I relied on for decades . . . salad dressing, mayonnaise, barbecue sauce, mustard, and marinades, to name a few. Even the staples that were supposed to be “allergy-friendly” contained at least one of my allergens or were not certified gluten-free. 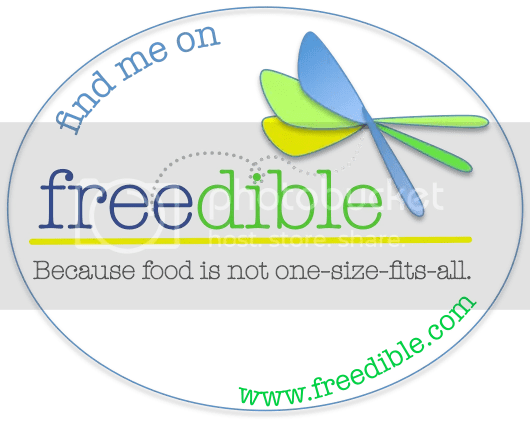 I was still struggling with my new way of eating and cooking when I met Colette Martin on the shuttle bus heading to the Food Allergy Bloggers Conference in Las Vegas. Because I knew Colette was the author of a well-respected cookbook on allergen-free baking and because she was pretty much captive on the bus, I complained to her about how I couldn’t find any decent allergy-free mayo. Turned out she was in the middle of writing her next cookbook and she was working on a mayonnaise recipe! (I didn’t admit this at the time, but I ‘d never even considered making my own mayo from scratch! Who does that?). Fast forward eight months. A reader’s copy of The Allergy-Free Pantry: Make Your Own Staples, Snacks, and More Without Wheat, Gluten, Dairy, Eggs, Soy or Nuts (The Experiment, September 2014) by Colette Martin arrives in the mail! Of course, I immediately flip to the mayo recipe. I follow the steps to make the mayo using a hand-mixer that I’ve moved into three houses but have never plugged in. Hmmm, not so difficult after all. Wait! This mixture is actually starting to look like mayo! Using my finger, I put a little on my tongue. It tastes like mayo. Maybe even a little better than what I remember mayo tasting. I decide to make Colette’s potato salad. Did I mention I have really missed potato salad since becoming allergic to eggs/mayo? 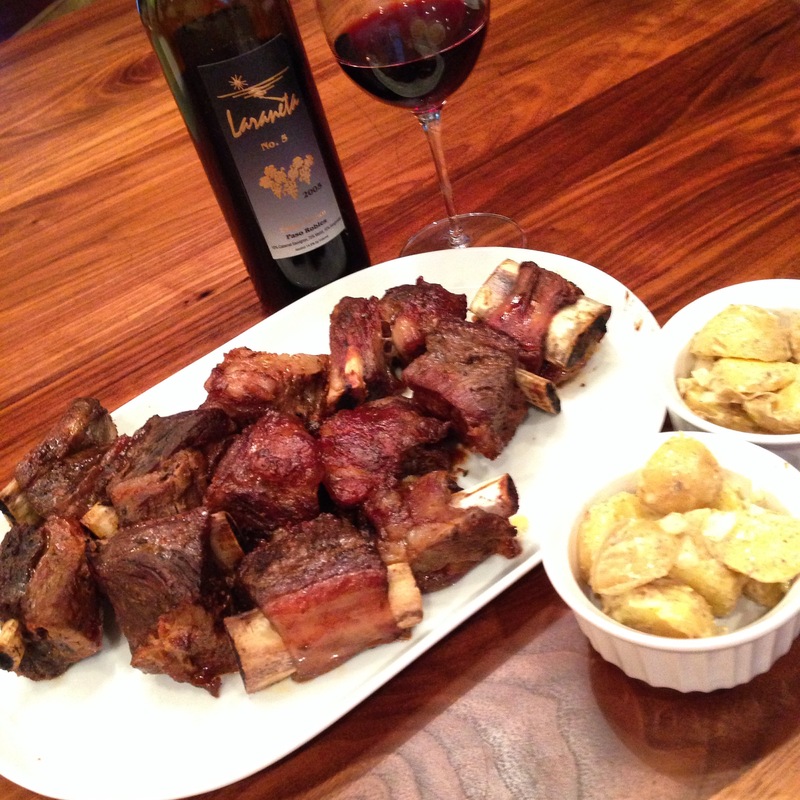 I serve the allergy-free potato salad and short ribs to my family. I don’t tell them about the flaxseed, which might turn them off. No one notices the mayo is eggless or made with flaxseed–they all help themselves to seconds. Since that fateful day of making mayo, The Allergy-Free Pantry hasn’t left my kitchen island. Using this book, I now make my own allergen-free ketchup and mustard and barbecue sauce. I’m planning to branch out to crackers in a few weeks. For anyone with food restrictions, this cookbook will become your most-used kitchen tool. You can pre-order a copy today at Powell’s, Amazon, or Barnes and Noble. Thank you to Colette Martin for writing this book and for sharing her flaxseed mayo and potato salad recipes (below). Recipe from The Allergy-Free Pantry: Make Your Own Staples, Snacks and More Without Wheat, Gluten, Dairy, Eggs, Soy or Nuts, copyright © Colette Martin, 2014. Reprinted by permission of the publisher, The Experiment. Available wherever books are sold. 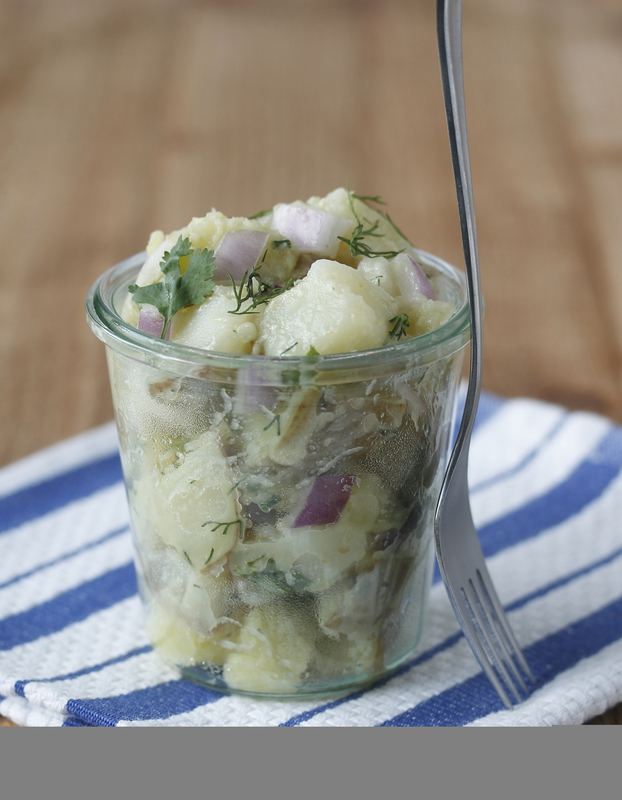 Friends and neighbors will have no idea that this allergen-free version of potato salad was made without traditional mayonnaise or off-the-shelf salad dressings. Instead, Flaxseed Mayonnaise (page 99) is used to make a salad with added fiber and essential fatty acids—and that tastes marvelous! Add some blue potatoes, if you can find them. Even though this potato salad contains no eggs or dairy, be careful not to let it sit out longer than an hour; it’s the potatoes, not the mayonnaise, that contain the bacteria that can make you sick. Place the potatoes and ½ teaspoon salt in a large pot. Cover with water and bring to a boil over high heat. Lower the heat to medium and continue boiling for 10 to 15 minutes, until fork-tender but not falling apart. Place the potatoes in a strainer and run cold water over them for 30 seconds to halt the cooking. Drain the potatoes well. Combine the onion, pickles (if desired), flaxseed mayonnaise, herbs, and remaining ½ teaspoon salt in a large bowl. Add the potatoes and stir to coat. Cover and chill the potato salad for at least an hour before serving. It will keep for 3 days in the refrigerator. Because this mayonnaise starts with flaxseeds rather than eggs, it has the benefit of being both healthier and tastier than traditional mayonnaise. Even if you aren’t allergic to eggs, this might just be the best sandwich topping you have ever tried! Use measuring cups with a spout to measure the oil; this will allow you to pour the oil directly into the container for your blender when making mayonnaise. Combine the flaxseed eggs, salt, mustard, and lemon juice in a working glass or the container for your immersion blender, blender, or food processor. Pulse four or five times to combine the ingredients. With the blender running continuously, pour a few drops of canola oil into the container. The slower you pour, the better. The mixture will start to become creamy as emulsification occurs. Continue blending and adding oil in a slow trickle until all of the oil is incorporated; add all of the canola oil first and then the olive oil. If the oil starts to pool on top of the mixture, slide your immersion blender up and down ½ inch, or stop pouring until the oil combines. Cover and refrigerate for up to 1 week. The mixture will set further as it chills. A single oil or any combination of oils (up to ¾ cup/180 ml total) can be used to make this mayonnaise, with the exception of coconut oil or palm fruit oil (which behave differently). Use less oil for a thinner spread. Make Chia Seed Mayonnaise by substituting 2 Chia Seed Eggs for the Flaxseed Eggs. Making Mayo with Colette Martin appeared first on Adventures of an Allergic Foodie. My gluten-free college boy is home! I’d planned on making him a smorgasbord of gluten-free meals, which he doesn’t get in school, but I haven’t. 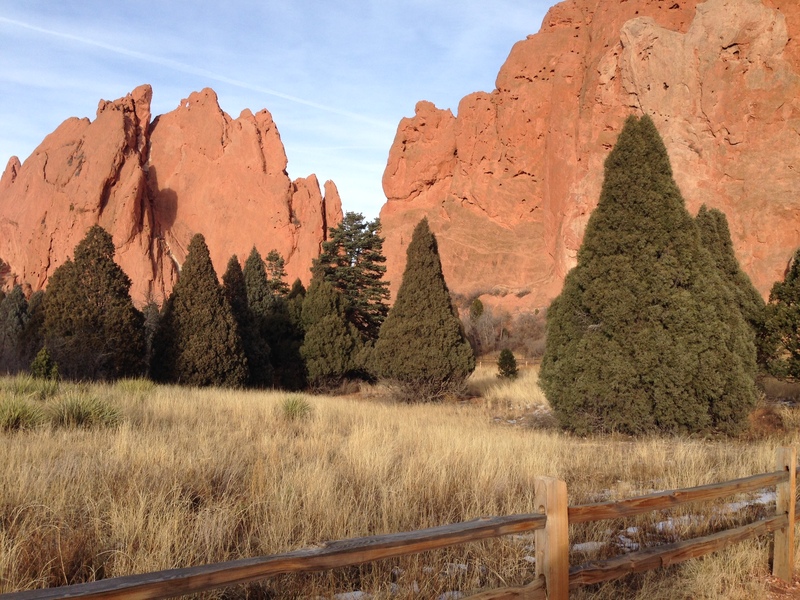 It’s unseasonably warm here in Colorado, warm enough for walking under blue skies in Garden of the Gods. Who can blame me, right? But today I decided to make something for lunch other than gluten-free microwaved burritos. Chicken Salad. 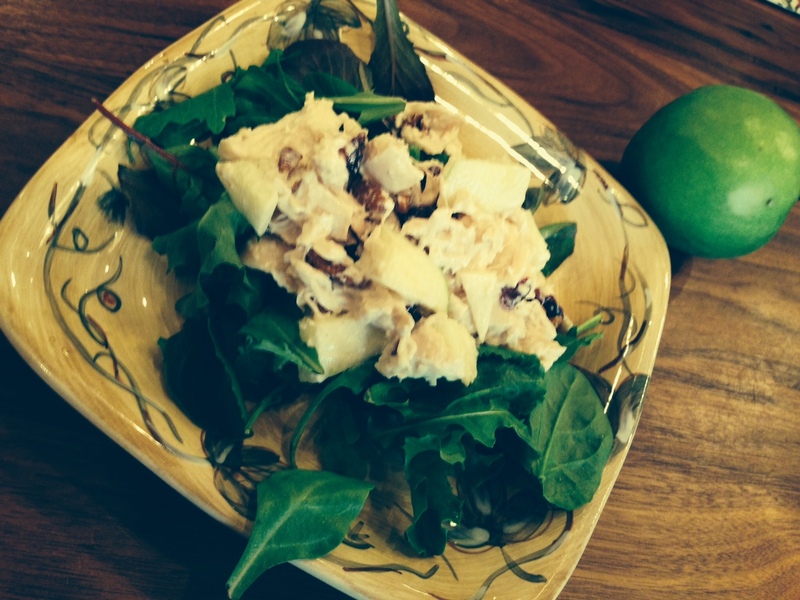 Which I named Easy Holiday Chicken Salad because it has green apples and red dried cranberries, and it takes minutes to prepare. I didn’t use any seasoning because the rotisserie chicken already had a lot of flavor. I ate my chicken salad on a bed of baby greens. Steve ate his on a gluten-free baguette. 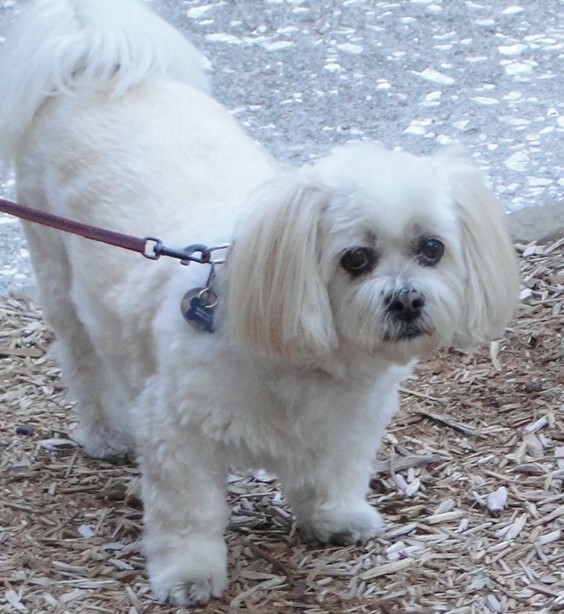 Then we went for a walk. I find the fewer ingredients in recipes the less chance this allergic foodie will get sick. My general rule is less than ten ingredients. So I was thrilled when my friend Susan brought over a simple salad to this weekend’s outdoor barbecue. It was the perfect accompaniment to grass-fed steak on the grill and organic potatoes pan-fried in olive oil. Add some good wine and wonderful conversation, and it was the perfect way to spend an August evening. Place lettuce in large bowl. Whisk oil, lemon juice, shallot and mustard in small bowl to blend. Add salt and pepper to taste. Mix in chives. Drizzle the dressing over lettuce and toss to coat. Add cheese, if desired. Serves 4. The other simple salad I’ve been making a lot this summer is grilled romaine hearts with tomatoes and bacon. Take a cooking brush and brush olive oil all over romaine. Place on med-high grill and cook for two to three minutes, until the leaves are slightly brown. Remove and add tomatoes and crumbled bacon. Drizzle with balsamic vinegar and season with salt and pepper. Add cheese, if desired. 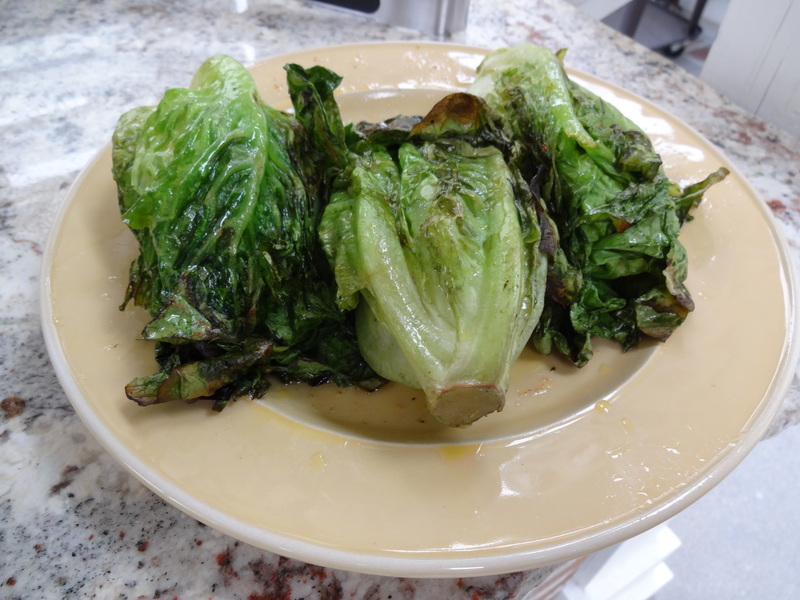 Susan’s Simple Salad dressing, above, would also be delicious on grilled romaine. For more allergy-friendly salads, follow my Pinterest board, Queen of Salad. 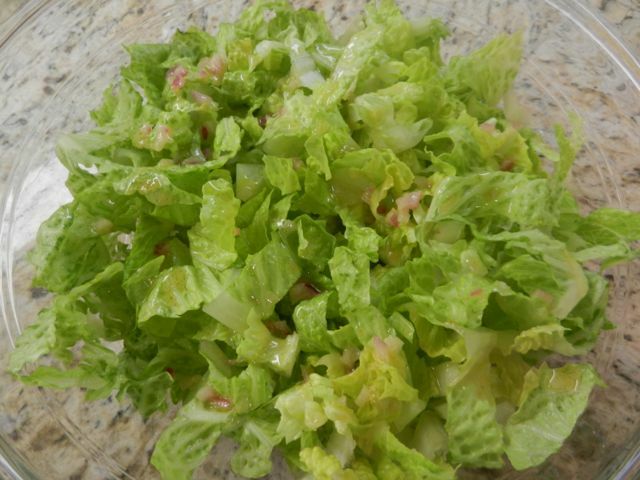 If you have an easy-to-make salad that’s allergy-free, add your recipe or a link below. Soup: It’s What’s for Lunch! Yes, I do feel lucky to live in such a beautiful place. While my husband puts on a suit and commutes to his office job, I grab a cup of coffee, walk up the stairs (usually still in my PJs), and begin to write. Lucy, my thirteen-year-old llaso apso, sleeps under my desk until it’s time for lunch. This is Lucy, the best critique partner ever. Now what was I getting to? Oh yes, lunch . 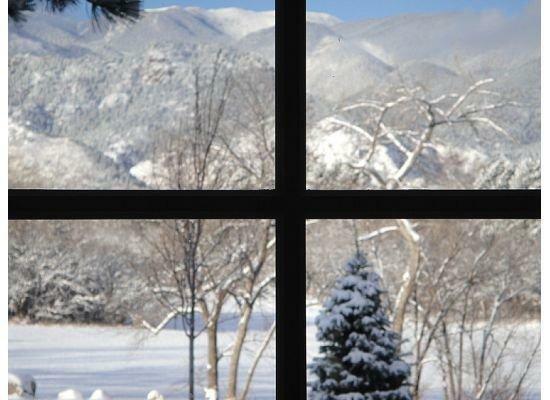 . .
Because there’s suddenly snow in Colorado, I’ve been making lots of soup for mealtimes. I discovered a few years ago that soup is a great meal for those of us with food allergies–just leave out the ingredients you’re allergic to! Plus a bowl of soup is super easy to heat up when you’re starving and in a hurry (I tend to lose track of time when I’m writing). The best soups I’ve created are the ones using leftovers . . . beans and ham, chicken and grilled vegetables, pureed tomatoes and flank steak. Last week, the start of the lenten season (no-meat Fridays), I made Manhattan Clam Chowder. Kudos to Max Johnson, executive chef of the Sea Pines Country Club in Hilton Head, South Carolina, for sharing this recipe in the club newsletter. In a large pot, heat oil and cook bacon until crisp. Add celery, onions and carrots and cook until tender. Stir in thyme and clam juice. Bring to a simmer and add tomatoes with juice and clams. Bring to a boil. Now add potatoes and cook until tender. Season to taste. Delicious by the fireplace on a cold Colorado day! What is your favorite wintertime soup?